Hoopty Rides: This sentence no verb. When I was a kid, I begged my mother to buy Metamagical Themas from the Quality Paperback Book Club. At that point in history, tying quality and paperback together in the title was a statement of proletariat intellectual snobbery. Though I have shaken the paperback mentality and have embraced the hardcover without reservation, readers will be glad to know that I am still a terrific snob. Having suffered through the first chapter of Godel, Escher, Bach three times and understanding it less with each reading, Metamagical Themas was, comparitively, very 13 year old accessible. It was a bunch of Hofstadter articles from Scientific American with the killer early hook of the self-referential sentence - a sentence that refers to itself, maybe negates itself. Like the classic junior high school algebra class poster board sign hanging from the T-Bar acoustic ceiling by a piece of fishing line - "The statement on the other side of this card is false" and "The statement on the other side of this card is true." I am still a sucker for self-referential and my favorite examples are the truck tailgate murals of Southern California. I have seen far less than a dozen in my life and have followed drivers miles out of the way to get a good look. The self-referential tailgate mural shows an ideal life which features the very truck that has the mural. 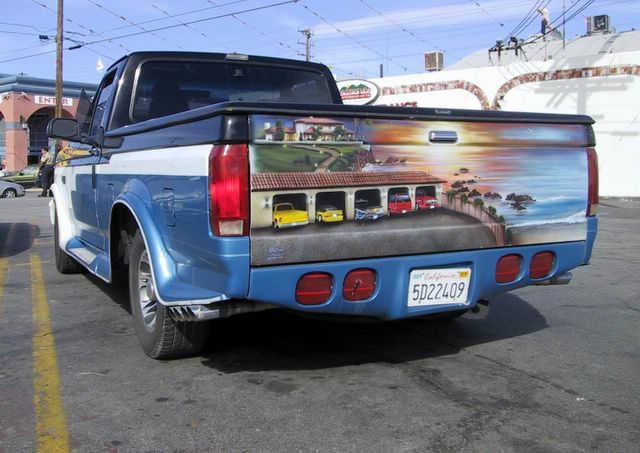 The smaller truck in the painting has a scale version of the tailgate mural. And so on. Like a hall of mirrors. In this mural, the garage features a dream car garage. From left, a yellow Ford truck, a Ford Mustang convertible, the actual mural toting Ford truck, a red Chevy Suburban and some sort of Jeep. In this example, the ideal is to live on a cliffside with a low voltage lighting path from the garage. The most common version of paradise that I have seen is a Mexican pastoral with goats and chickens, doing laundry by the river, a big party under a tree and garages loaded with Italian super cars. The unusual aspect of this particular mural is the Ford trucks mixed in with the Chevy Suburban. Sure, Ferrari's and Countach's are one thing, but mixing Ford and Chevy? Paradise represented in tailgate murals is rarely brand agnostic.